At last the Celtic support, of both Belfast and Glasgow, has a history of one of its most famous characters. Charlie Tully is perhaps our best example of the oral tradition of the two Celtics. Everyone growing up with the constant presence of the green and white hoops knows and loves Charlie. Whether we learned his tale from a father or grandfather, an old schoolteacher or a treasured older Celtic fan, Charlie Tully was a central part of the Celtic story, and with each retelling his legend grew greater, his exploits more daring and his character even more larger than life. Tom Campbell, from that privileged position of a Celtic fan who watched in awe of Charlie Tully, picks the story up from that proud oral history, polishes it and tidies it, and gives it back to the Celtic community as an accurate picture of the man so lauded by the legions of fans who never even saw him play. This book contains every aspect of Charlie Tully – the silky attacker, the hot-head, the family man. Campbell makes no mistake when he says he will present Charlie Tully objectively and as dispassionately as it is possible for a Celtic fan of his generation to do. Many of the most tumultuous events in Celtic’s history occurred during Charlie’s time, and Campbell intertwines these stories well with his biography of Tully. Some, like the Eire Flag Dispute, Charlie was incidental to. Others, like the Cox-Tully incident and the ensuing riot, Charlie was a central figure in. There is a wealth of commentators on such incidents, both who knew Charlie and who observed him from the terracing, and so the book maintains the spirit of that oral tradition. It is supporters telling younger supporters the history of their club, community and the characters that make it so special. Most special of all, though, is the humour that shines through the descriptions of Charlie. The larks and jokes tell us more about the man than any history ever could, and it is a privilege to see how his pride shone through humour, self-deprecating though it often was. Campbell shows a side of Charlie Tully supporters can relate to, as he pokes fun at Rangers and their dour image. Though Campbell notes the fact that such good humour may have cost Celtic trophies, he wastes no time in quoting from Charlie’s autobiography, ‘One thing about Paradise and all who dwell within – you are always good for a laugh. You fill with warmth for the man at moments like that, and it is a great credit to the book that Campbell has written that he can create such feelings in those who neither knew nor watched Charlie Tully. Of course, the real credit goes to Charlie himself for his wit and warmth, but Campbell presents him well, listing various ‘Tullyisms’ at the end of his book and putting flesh on the bones of the legends, myths and rumours. There is font of knowledge here, in journalist Malcolm Brodie, in Charlie’s children, in the fans of both Celtics who watched in wonder as Charlie worked his magic. Campbell himself proves more than worthy of recounting the experiences of a Celtic fan of those times, making this book unparalleled as an account of Charlie Tully. Much has been written in newspapers and in other books, but the biography proves to be the definitive account. Through his career, up to his early death, we see Charlie’s progression as a player and manager, we find his passions and his weaknesses and we are shown his personality. 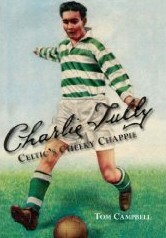 For those interested in Charlie Tully, Celtic and Belfast Celtic the book will prove invaluable. For those who don’t yet have any depth of knowledge on the subjects, it is sure to ignite in the reader the passion that we followers of Celtic share for and with Charlie Tully.